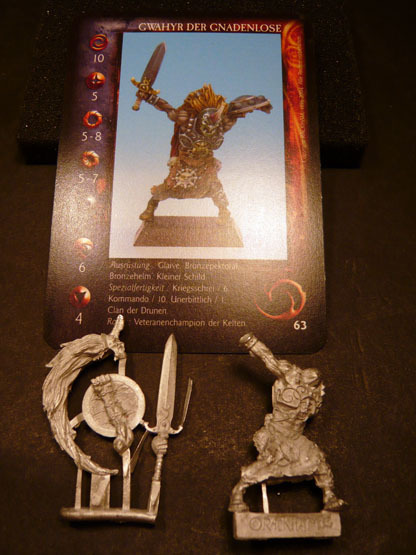 Beastmen, Movember and Kickstarters Oh my! I would like to point you once again to Shawn "PPC" Welte and Mike Butcher's sites as they have each posted some pretty great info about their thought and design process in the Beastman figures they made for me. Following along the same lines below I will post a couple of pics of the model that I made for Shawn and a little info on what it is all about. Before I get to that, however, I would like to plug my Movember campaign page. Movember is a month long fundraiser where guys shave their faces and then proceed to grow moustaches across November. This is done in hopes of attracting fundraising pledges and to create a visible public spectacle drawing attention to men's cancers and mental health issues. If you would like to pledge me even just a little(every $ counts!) please click and add to the cause. Shawn's army is comprised mostly of mutant freaks with a very marauder/barbarian kind of feel. 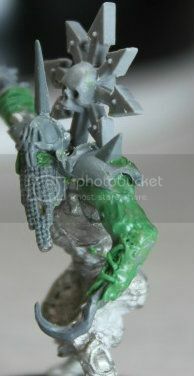 He has not limited himself to GW models or parts so I didn't feel in any way constrained to that either. 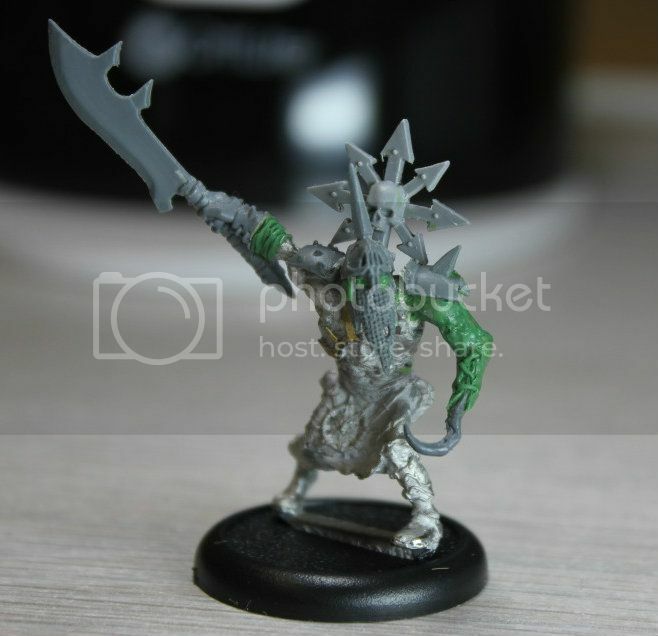 I chose an OOP Rackham figure Gwahyr the Merciless as the basis. 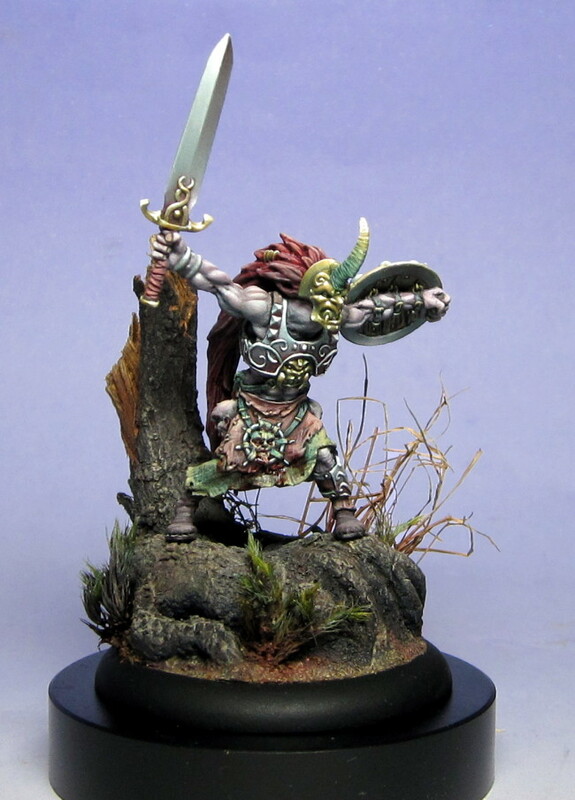 This is one of my favorite miniatures - the sculpting is incredible, the pose is really different and the minute and strange details on it remind me of the kind of thing I would expect in a John Blanche illustration. <---Here is a pic of a painted Gwahyr. (not my work) I just grabbed this pic from the net so that you can better see some of the cool details. It should enlarge if you click it. I immediately ditched the head and the shield arm and then pinned a new weapon hand together using great weapon bits from the GW Grave Guard kit - I love these blades - they have a very different and exotic but definitely brutal feel to them. 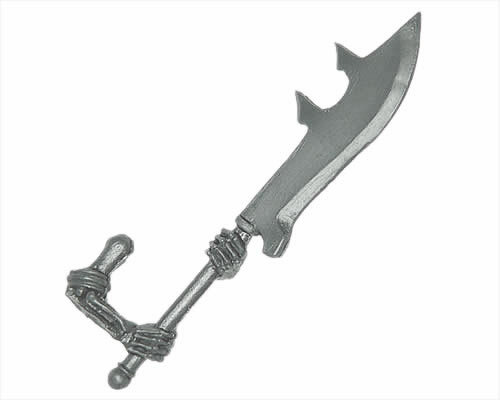 Turning this from a two handed weapon to a single handed sword helps give a bit of bulk to this thin figure and ties it nicely back to the GW range. 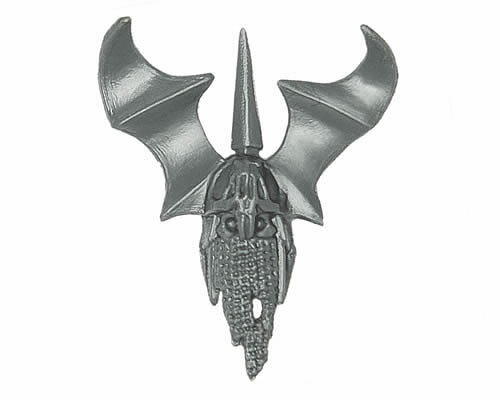 Likewise the Grave Guard helmet received a little editing. I felt that this undead head was proportionately a good fit with the body and again hinted at a bit of an exotic look, very much in contrast to the typical Empire or Brettonian styles (the whole design made me think a little of the Persians in the movie 300). I simply trimmed off the bat wings and smoothed in the side plates with some Green stuff. I also filled the hollow undead eyes with GS making proper paintable eyes. 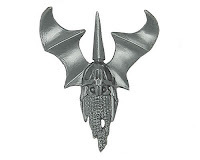 I ground some of the filigree off of the chest plate and replaced it with a brass piece of a chaos star from a Forgeworld Brass etch set. I then set about replacing the left arm. I positioned the shoulder and the arm to give him a bit of a lurching pose that was maybe a little zombie-esque (and fit also with the slightly turned in directions of his feet). I felt this would correspond to the very Nurglish way I was going to treat this arm and would maintain the forward motion of this model (though less explosively so than the original base figure). I used a hook for the hand (remembering that this was supposed to be some kind of mutant or blessed of the chaos gods) and made it look as though it had been jammed and partially sewn into the stump of the arm. I added some textures to the arm that look a little like the dogs breakfast in these pictures, but which I think should paint up nicely as necrotised/infected tissues with a careful glazes or tonal blends. 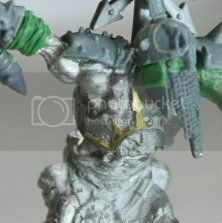 I then capped the shoulder with a little piece of armour - again from the Grave Guard kits. The model already had ample skulls hanging from the belts etc so I decided that to really put it over the top I would make use of the straps sculpted all across the back to add a shoulder mounted chaos icon. 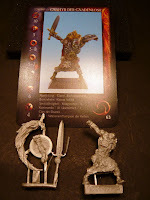 This would give meaning to the hunched posture of the figure and ensure that this slightly more petite sculpt would still fit in well with any models displaying the traditional bulk of GW chaos pieces. 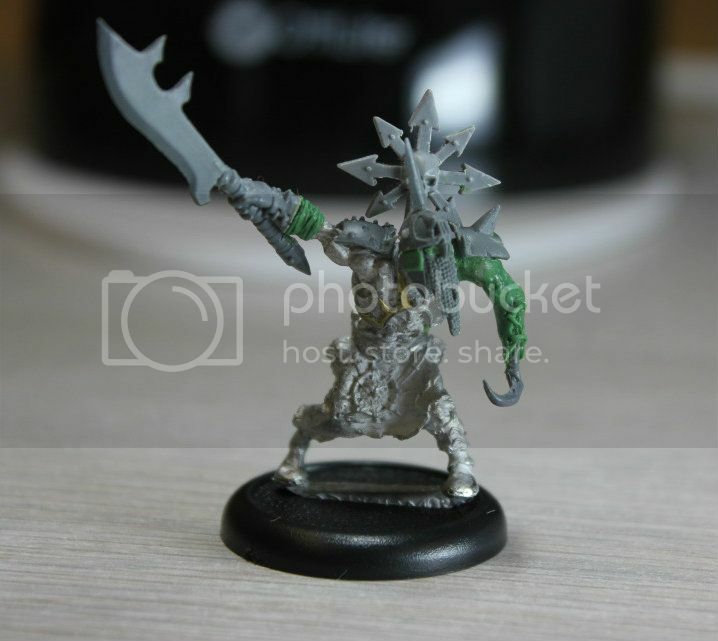 All in all it was a pretty simple conversion - took me two or three casual evenings interspersed with a couple other pieces and produced something that I think is super cool and that I would definitely field for myself. I can not wait to see how he will look once Shawn gets to painting him. Check his blog The Madhouse Workshop for updates on his progress! Nice! That is how I get my conversions done, a little at a time. That's a great conversion, and I'll be pledging for the Free Mars Kickstarter. Also congratulations, as I've given you a Leibster Award. Take a look at Screwed Up Dice to see the list of winners.